Lord Mzderio was deported to Mexico from San Diego last year. He wouldn’t elaborate on the reasons, but told me his aim, now that he was in D.F., was to make it big in the Mexican rap game. 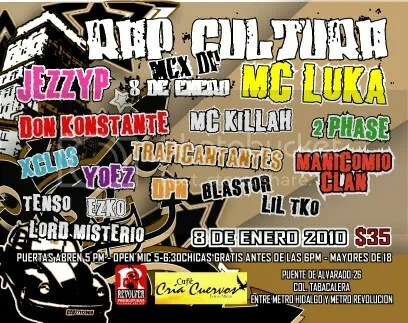 RAP CULTURA event in Mexico City. Mzderio says this flyer has his name spelled wrong. 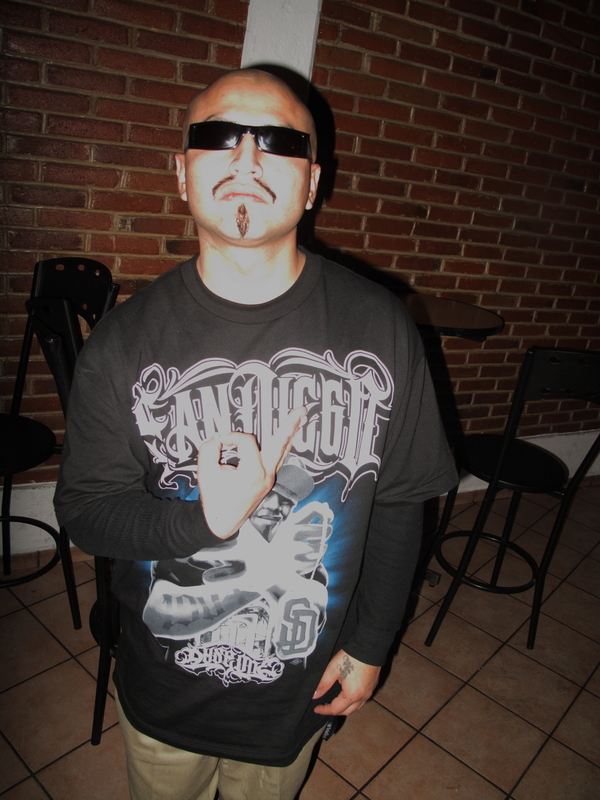 The 20-something performer, who rhymes in Spanish, told me the only thing he found troubling about Mexico City, so far, was that his choices for cholo fashion leaned heavily toward L.A. It’s nearly impossible for him to find Padres stuff. Something gangster that didn’t rep that pinche city up north. He says he’s an S.D. gang member. 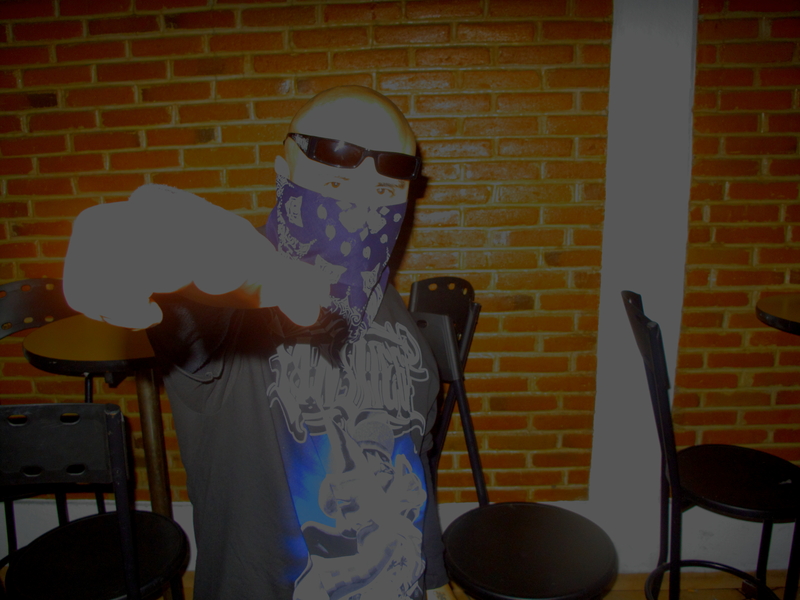 We had a quick chat after he performed in a virtually empty hall located at a goth club near El Centro Historico, on Puente de Alvarado in Col. Tabacaleraon, turning it into a rap showcase for Mexico City’s elite underground rappers. Those who had paid some dues. Mzderio regaled me with tales of being locked up in the county jail, and how he was deported after he got out. He had just arrived some months ago in the city, and was now living in Ecatepec, about 14 miles north of Mexico City. What happened to Mzderio is possibly what happened to about 300 people in Texas on Friday. Of the total, about half of the immigrants had convictions for violent crimes or drug offenses. Large scale deportations like that are carried out by a branch of Homeland Security called, ICE. It was created in 2003 as a response to 911. Now, it’s part of a plan to rid the U.S. of as many people (“aliens” as they say) from Mexico and Central America, as well as other places, by 2012. Secure Communities has come under scrutiny for the relatively low number of persons caught who have been convicted of violent crimes – or what’s known in ICE as a “level one” offense. The immigration databases that the Secure Communities program taps are not infallible. They list only foreigners who entered the United States on a visa or who were caught trying to sneak in but later released. Those who have never crossed paths with immigration authorities are not singled out — the same as U.S.-born citizens. Deportations doubled in the last 10 years according to this Medill report. The article goes on to point out that Mexicans are always the majority of the targets. Mexican nationals have had the highest rate of removals throughout the decade, making up more than 80 percent of total deportations in 1999. However, this share dropped to about 70 percent in 2008, with other nationalities making up more of the total. In Lord Mzderio’s case, whether for right or wrong, he’s here in Mexico now, and can share his passion for writing raps with another generation of Rap Kids, who need role models in a sea of Punks, skater kids, Chavs, Emos, Rockers, Fresas and Rastas. Photos and interview from January 8, 2010.